Is Media Merger Mania in the Making? Are media companies set to be the next big thing in M&A? Bloomberg reported Friday morning that Cox Communications Inc. may be considering a merger with rival cable provider Charter Communications (CHTR). Charter, the No. 4 U.S. cable company by subscribers, is 27% owned by Liberty Media; Bloomberg reports Liberty Chairman John Malone is looking to grow Charter to secure stronger standing in negotiations with TV networks seeking ever-higher prices for use of their content. Meanwhile, Liberty and Charter are still reportedly pursuing a deal to acquire Time Warner Cable (TWC); a Cox deal is said to be a possible "plan B" if Time Warner balks. Charter shares were up 4% to $133.12 in midday trade following the news. Cablevision (CVC) shares were also seeing a boost Friday morning, up 4% to $19.39 midday, after a second-quarter earnings beat and remarks by CEO Jim Dolan that made him appear more open to a merger strategy in the future. Friday's headlines speak to other (still hypothetical) pairing possibilities likely to arise before long. For instance, why shouldn’t Time Warner Inc. (TWX) merge with, say, CBS Corp. (CBS)? Doesn’t it make all kinds of sense for Netflix Inc. (NFLX) to scoop up a hit-making movie-and-TV producer such as Lions Gate Entertainment Corp. (LGF)? And sure, satellite leaders Dish Network Corp. (DISH) and DIRECTV (DTV) were thwarted in their attempt to combine a decade ago - but why not try again now? 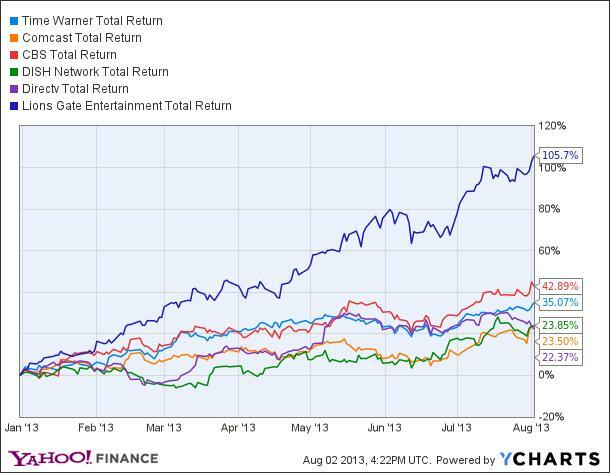 Media stocks have been blockbuster hits the past couple of years, nearly all of them trading at an all-time high. The sector-tracing PowerShares Dynamic Media ETF (PBS) has gained 55% over the past two years and almost 30% year to date. Their companies’ balance sheets are strong, and debt capital is plentiful and cheap for them. Consumers continue increasing their media-absorption time across all screens. Big media companies such as Time Warner, Twenty-First Century Fox Inc. (FOX), Viacom Inc. (VIA), CBS and Walt Disney Co. (DIS) have all shown greater operating discipline, focusing intently on hiving off non-core businesses while returning capital to shareholders through buybacks and increased dividends. On some level, this cheery narrative goes against the standard line – widely accepted for years – that traditional media players are on the verge of being upended by “over-the-top,” à la carte entertainment offerings such as video-streaming services. But it turns out content itself keeps commanding higher prices, the cable “bundle” remains cost-efficient for heavy media consumers and, crucially, cable companies lead in selling the broadband service over which so much entertaining video programming is beamed. So most players feel they are operating from a position of strength in a growing, dynamic market – yet because technology and consumer behavior are shifting so quickly, every media executive feels his or her company could use another piece to capitalize on the environment. Meantime, nearly all the stocks are trading at towering premium valuations of profits versus their history – leaving management hard-pressed to satisfy investors through organic growth over the long term. This all creates a ripe backdrop for deals. This means the likes of Netflix, Apple Inc. (AAPL) and Amazon.com (AMZN) might be in a rush to lock up their own sources of programming. Meantime, the success of Comcast Corp. (CMCSA, CMCSK) in exploiting the marriage of cable distribution and the NBC Universal cable-network business has strengthened the case for vertical integration. Kannan Venkat, an analyst at Barclays Capital who last week launched coverage of the cable-and-satellite industry, contends that “2013 could prove to be one of the most active for cable M&A.” Ever-escalating costs for cable programming drive operators to seek greater scale to enhance buying power and create cost efficiencies. Aside from the possible horizontal consolidation deals in cable, there are three main categories of potential deals that appear likely to arise. -Netflix with almost anyone. The streaming-and-DVD subscription service is mentioned constantly as a potential target for Apple or Microsoft Corp. (MSFT) as a platform for content distribution. Of course, Netflix doesn’t now need to seek help, with its $15 billion market value, stupendous subscriber growth and shares up 350% in the past year. And it has already been aggressive in producing its own content, including its Emmy-nominated “House of Cards” series. CBS CEO Les Moonves said last week it's happy to distribute some of its hit shows through Netflix, and even produce some especially for it. Yet it’s not hard to envision a time when Netflix feels the need to gain rapid scale in programming, perhaps making Lions Gate (owner of the “Twilight” vampire-movie franchise and producer of cable’s “Mad Men”) a target. If not for the fact that Netflix shares trade at such a blindingly expensive multiple of 76-times forecast 2014 profits, a combination outright with the likes of CBS could even shake up the business in a sort of latter-day, less-risky replay of the AOL-Time Warner merger. -The cable network companies. Discovery Communications Inc. (DISCA) and AMC Networks Inc. (AMCX) – both part of larger media outfits not long ago – appear priced for perfection, or a buyout. Discovery is valued at some 25-times 2013 earnings, AMC at 21. They are growing nicely as the fees they charge cable companies grow along with targeted ad revenue. Yet there simply aren’t that many great basic-cable network brands available, which will no doubt generate interest among the bigger media conglomerates or one of the cable/streaming distributors. -Satellite consolidation. Dish and DIRECTV had a merger scuttled in 2002 on antitrust concerns. Barclays' Venkat notes the current environment is quite different, with more competition and consumer choices, yet regulators might still balk. Nonetheless, he expects the companies to try at some point, perhaps after Dish – which just made an abortive run at Sprint Corp. (S) – explores options for monetizing its valuable broadband-spectrum assets. In his scenario, DIRECTV would pay a sizable premium for Dish, and create huge efficiencies. Venkat also offers that Dish may look to buy Deutsche Telecom’s T-Mobile US Inc. (TMUS), given its recent interest in picking up a cellular franchise in Sprint.